﻿Outline and describe the issue you have studied in Social Approach. 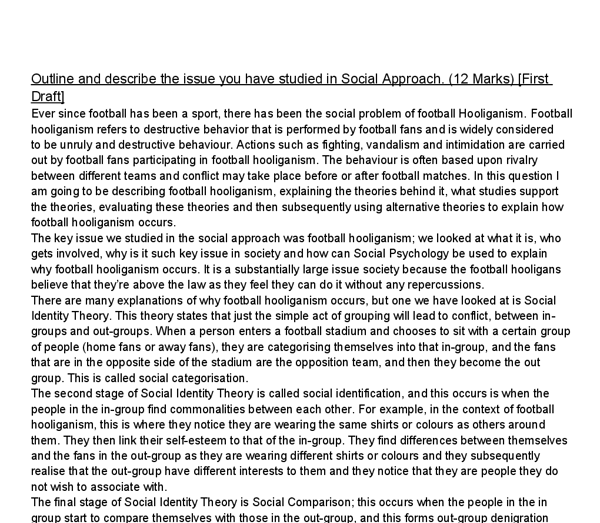 (12 Marks) [First Draft] Ever since football has been a sport, there has been the social problem of football Hooliganism. Football hooliganism refers to destructive behavior that is performed by football fans and is widely considered to be unruly and destructive behaviour. Actions such as fighting, vandalism and intimidation are carried out by football fans participating in football hooliganism. The behaviour is often based upon rivalry between different teams and conflict may take place before or after football matches. 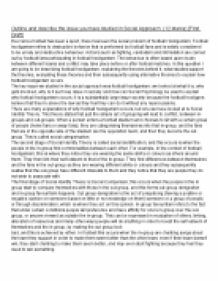 In this question I am going to be describing football hooliganism, explaining the theories behind it, what studies support the theories, evaluating these theories and then subsequently using alternative theories to explain how football hooliganism occurs. The key issue we studied in the social approach was football hooliganism; we looked at what it is, who gets involved, why is it such key issue in society and how can Social Psychology be used to explain why football hooliganism occurs. It is a substantially large issue society because the football hooligans believe that they?re above the law as they feel they can do it without any repercussions. ...read more. In-group favouritism refers to the fact that under certain conditions people will preference and have affinity for one?s in-group over the out-group, or anyone viewed as outside the in-group. This can be expressed in evaluation of others, linking, allocation of resources and many other ways.people will do anything in order to boost the self esteem of themselves and the in group, by making the out group look bad, and this is achieved by either. In football this occurs when the in-group are chanting songs about the team they support in order to make them seem better than the other team; even if their team doesn?t win, they start chanting to make them seem better, and may even start fighting because they feel they need to win something. Social Psychology, in my opinion, can be used to understand, prevent and stop football hooliganism to some extent, as Social Identity Theory helps explain why football hooliganism occurs. For instance, Social Identity Theory states that when people enter a stadium, they choose to sit with people that also support the team they have come to the stadium to, and, furthermore, choose this group of people are their in-group. ...read more. It suggests that it is not just the creation of two groups that leads to prejudice, but that they need to have a goal in sight for conflict/prejudice to develop. Secondly, there is a theory that when humans have their sense of humanity taken away from them, and they are in turn treated as if they are animalistic. This can be used to prove football hooliganism because they are in conflicting goals and therefore they are fighting like animals in order to receive the prize of a football victory. In conclusion, I think that the use of Social Psychology can be used to understand and, more importantly, prevent football hooliganism. This is because the Police could use Social Identity Theory to understand what they needed to do in terms of policing the stadium, keeping peace and where to ?shepard? the fans. This could possibly reduce the amount of prejudice and discrimination at a football match, and therefore, using Social Identity Theory, reduce the amount of football hooliganism. However, I believe that football hooliganism isn?t a result of just Social Identity Theory; I think passion for the game, as well as ?over-excitedness? has a part to play too. ...read more. According to Kuhn, a philosopher of science, this means that psychology is 'pre-paradigmatic' - it lacks a paradigm, without which it is still in a state of 'pre-science'. The fact that the brain has tripled in size in three million years is very fast in evolutionary terms. One force that can bring such rapid change is sexual selection. Miller (2000) suggests that a similar process of which has left the peacock with a long tail has also shaped human brains. Whistleblowing, The Problems and the Issue. lie, chasing the poor for debts, repossessions, sexism, carrying out decision democratically reached disagrees with, organisational hypocrisy, contempt of officers for lay officials, corrupt appointments: deciding when to take industrial action (Goodwin, 2000). These problems will effect the organizations in many ways, such as decline in efficiency. becomes deindividuation upon becoming a member of a group, and the behavioural changes that take place. Zimbardo (1969) reported three influential experiments in his paper, which became the basis for much of the redefinition of deindividuation that followed. The shock paradigm experiments involved allowing participants to dress in different costumes, to shock volunteers who could see them. One study done by Sherif was the Robber's Cave Study (1961). Realistic Conflict theory arises when there are limited resources this then leads to conflict, prejudice and discrimination between groups who seek that common resource. Once hostility has been aroused, it is very difficult to return to normal relations and an ongoing feud can arise. Evaluate two theories of altruism. work out closeness of other animals by jus looking so this could vary results. Also environmental factors such as protecting from predators are not always the type of altruistic behaviour carried out. Another explanatio9n for animal altruism is the reciprocal altruism theory. Investigating the validity of the matching hypothesis. Participants were given unlimited time to complete the task. After recording the results, the subjects were given a verbal debriefing on the nature of the investigation.